I will be doing a live stream tonight. Saturday 4/24/2010. I will be announcing the first winner of the Scroll Saw Woodworking and Crafts magazine subscription. You do not have to be on the stream to win. The stream will start approximately at 10pm Eastern time. I will spend just a few minutes talking about the new features of the blog. We will do the giveaway and then open the chat up for questions/general chat. I will moderate the chat to have a period of just questions. I had a difficult time last stream keeping up with the questions in the chat. I'll stick around as long as you guys wish to talk or until I fall asleep. 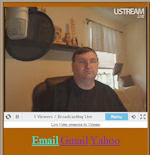 You can visit the live stream page by clicking the image above or clicking the same image in the left hand column of the blog. Sorry about the late notice but if you have time I hope to see you there. 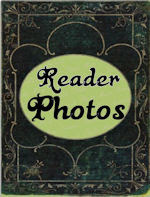 Major upgrade to the Reader Photo Gallery. After you register you can now upload your pictures to an album. There are currently three different albums. Projects, Shop Photos and mug shots. While you upload the pictures it will ask which album to put it in. Try to keep them separated. For now I will approve all photos before they show up in the album. I just want to make sure it stays family friendly. After you upload the photo be patience and I will approve ASAP. I imported all the photos from the old gallery. Unfortunately no user data was available in the old gallery. If possible I will try to go back through my email and update the photos with info. If you see one of your projects feel free to post a comment and let people know it was yours.